During our apple unit, we of course studied apples themselves. But I also wanted to use apples to explore other parts of the curriculum like science, literacy, and math. 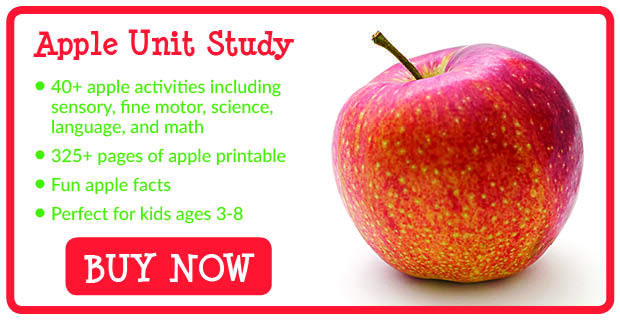 In this post I’m sharing an activity in which we used apples to practice the math skills of estimation and measurement. Estimating the circumference of an apple is a very easy activity you can do with just a few basic materials and virtually no prep time. And it provides kids with a fun and tangible way to think about size, length, and potentially how to use a ruler. I began by placing the apple in front of my kids. We talked about circumference being the distance around the apple. I let them hold the apple and feel around its circumference to get a sense for its size. 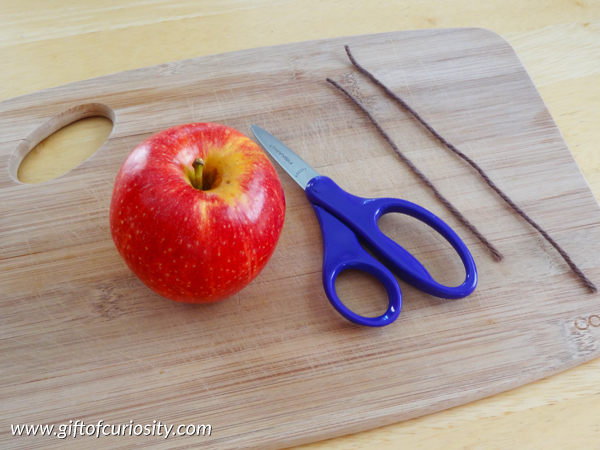 I then invited my kids to cut some yarn to a length that they thought would go around the circumference of the apple. Each kid estimated the amount of yarn they thought would be needed, and then made their cut. Once the yarn was cut, they tried wrapping it around the apple to see how close the estimate was. One length of the yarn was too short. And the other was a tad too long. 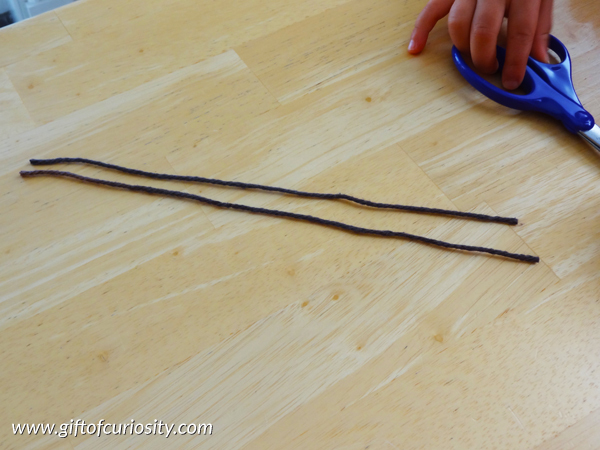 If doing this activity with multiple kids, have them put their strings into order from shortest to longest. For kids who know their numbers, have them measure their strings using a ruler. After checking whether their string is too short or too long (or just right! ), have them cut a second string to try to get closer to the true circumference of the apple. 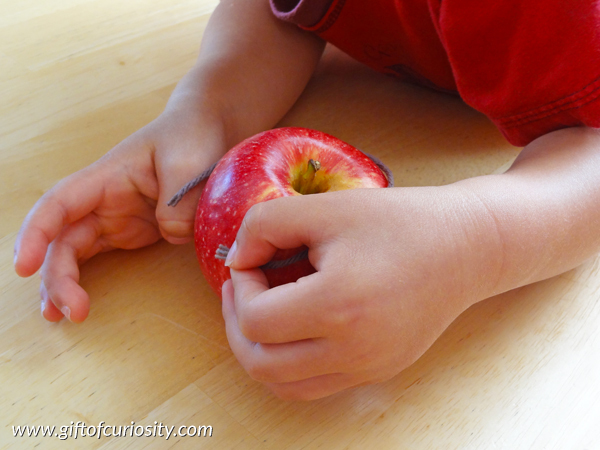 Use multiple apples of different sizes, and have kids measure strings for each of the apples. How else would you extend this activity to promote kids’ learning? This is a great activity. In our program we have a nutrition program called Food for Thought and this would be a wonderful addition to some of the math experiences we already have. 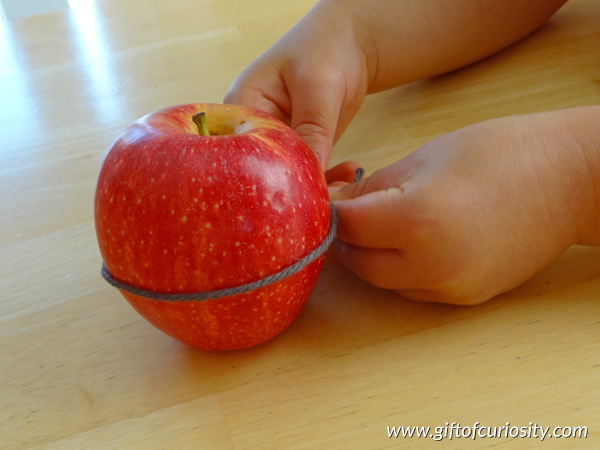 Another way to extend this is to have children guess the circumference of other items or fruits. Ooh, yes, it would be really fun to compare the circumferences of different fruits! Have the children measure around the apple over the stem. It might be interesting to see of the measurement is the same or different. Have different kinds of apples to compare sizes. Great ideas Joy! I really never thought to have them measure around the stem, but I love your ideas of comparing the measurements. Thank you so much! It’s a great pleasure to read all of your posts!!! If you have multiple kids, (or fruits) you can graph the results over multiple trials. (Short, Long, Just right) This will work also if you compare equatorial circumference to longitudinal circumference (adding geographical terms). What a wonderful way to learn math with apples! Thanks for linking up at the Thoughtful Spot Weekly Blog Hop! We hope you stop by again next week! 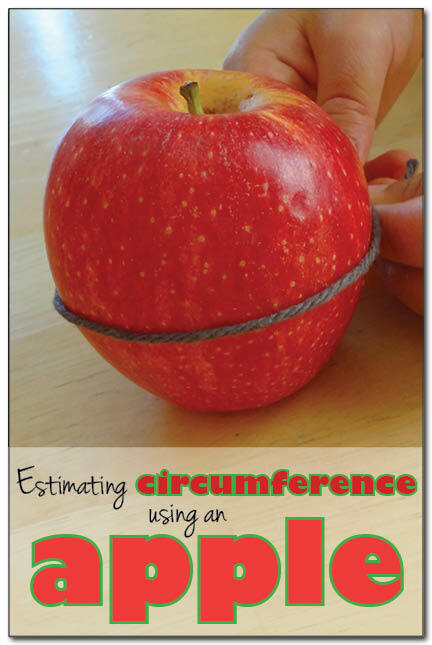 Very fun idea for learning about circumference and estimating! Featured you on Mom’s Library!